I recently restored a set of I. Sorby English mortise chisels, but the 5/16” one needed a new handle, due to an old woodworm attack and someone beating on it with a metal hammer. I had an old Jack plane that was surplus to requirements, so I was able to use some old dry beech for the new handle. I was a bit worried about drilling the stepped hole because I was doing it by hand and it needed to be accurate, but after much pontificating, I kicked myself up the jacksie and told myself to ”just do it”. Then I used a 1/4” and 1/8” chisel to enlarge the hole to match the taper of the tang, which tapered in two directions. The handle is held on by compression, so when the tang was a snug fit with about 3/4” of the tang still protruding from the hole, I lowered the blade into one of the dog holes on my old workmate so it rested on the bolster and pounded the life out of it to drive it home. Thankfully it went without incident and seated nicely first time. Just as well, as I don’t think it will ever come off again in one piece. Once the wooden blank was on the blade, I shaped it first with a couple of drawknives, then a rasp, then a file, then sanded to P180. Once it felt right, I filed in the convex shape to the top of the handle in both directions and eased the edge. Two coats of BLO and it was as good as new. Great work. That is one seriously beautiful set of chisels. Nice job on the handles. 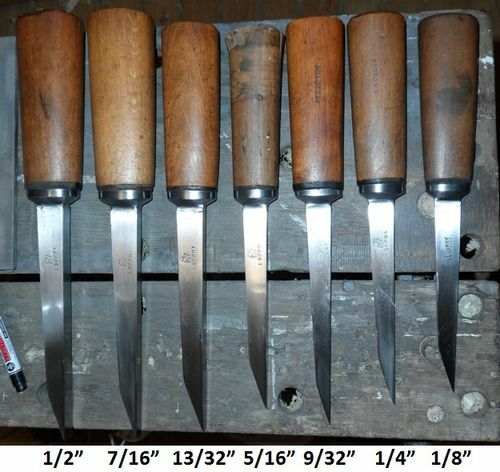 I covet your chisels. Great lookin’ work Andy! Are you planning a bench build since your shop is done? Gorgeous restoration. These lovelies deserve the love and care you gave them. It’s great that they ended up in your hands. Congrats on the beautiful set! Thanks guys. It was a lot of time on the diamond stones to bring all the chisels back to life, but you soon forget that once they are all done. I consider myself very fortunate to have a set as nice as these are. Are you planning a bench build since your shop is done? The shop isn’t done yet. I have to put up some dado rail, paint the inside of the windows and door white, lay a new floor, build some cupboards with a low work surface which will be my sharpening station/restoration area and put some French cleats on the walls so I can get some of my tools out of the crates they are currently in. I’m also going to improve the lighting. Then I want to build a folding saw bench with a difference that has been rattling around in my head for ages. A proper workbench will probably not get done in 2015, but I will throw something together to keep me going until I can build a better one and to help me build it when the time comes. Very nice Andy, fine work as expected ! Great restore Andy, looking forward to posting showing them in use. Andy, the chisels look fantastic! Great job on this and I look forward to more of your inspiring work in the new year. Take care! I love to see another galoot spending hours on a handle, especially for a Sorby tool. That handle came out really nicely Andy. What a great way to spend New Year’s eve. Wow that turned out nice, and fun that you did it the traditional way. The jack plane certainly sacrificed itself to a good cause, that’s a really nice set of pigstickers. Great work Andy, the handle came out exceedingly well! Any plans to put a replacement Sorby cartouche on the handle? A beautiful set that is now. Look forward to follow your shop build in this new year. Thank you gents, glad you like it. Slyy – None of the handles have a cartouche if I understand the word correctly. I won’t be doing anything else to the handle I made.